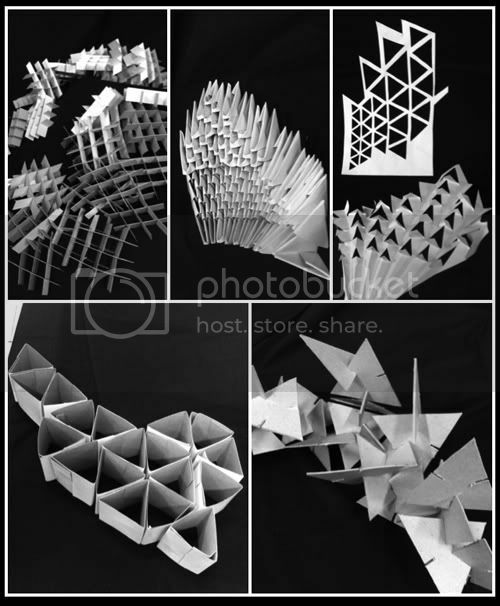 MORPHOGENESIS is a four-days workshop held by VOLUM3D at Bina Nusantara University, especially for the Architecture department of the campus. During the workshop, 30 students are formed into small groups of 4-5 and are challenged to produce a unique and buildable design, with the limitation of material and time. In this workshop, the only material used is cardboard. Students were asked to think of a concept of design and had form explorations by making small models of shapes. The shapes produced are then presented in front of the lecturer. On the second day, shapes and concepts produced on day one are then explored more in depth. During this stage, structures and technicalities of the designs are starting to be taken into account. The third day was the last day to think of the design and make adjustments to the designs. On this day, students started to create scale models of their designs' modules. Designs are finalized on this day; create a model that are ready to be presented to the judges. The last day of the workshop was spent on presentation in front of the judges. Students deliver their concepts and designs, and convinced the judges that their designs are buildable with the material and time being the limitation.